Mental Time-Traveling Apes. Enough Said. It's not only the hairless apes who belong to the mental time-traveling club. In the '80s, psychologist Endel Tulving coined the term "chronesthesia" - that is, mental time travel - referring to an awareness of the past, present and future. The American Psychological Association, in 2003, called chronesthesia a "uniquely human ability to act today based on our past and future." But a growing body of scientific literature indicates that non-human species, too, can plan for the future. Great apes, including chimpanzees, bonobos and orangutans, build tools for use down the line, according to a new study published in the American Journal of Primatology. To see how well apes can plan, two European primatologists stuck grapes in the ends of Plexiglas tubes that could only be reached by prodding with a stick. 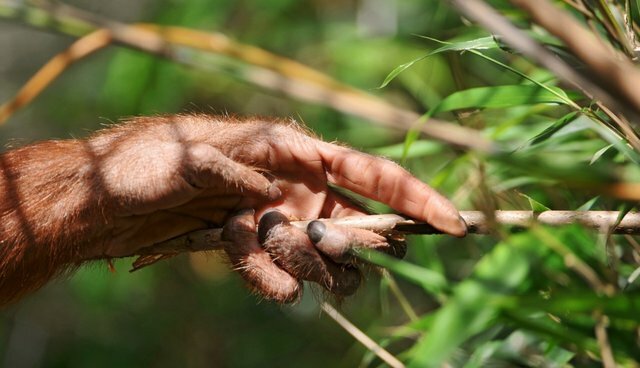 But researchers Juliane Brauer from the Max Planck Institute for Evolutionary Anthropology in Germany and Josep Call of the University of St. Andrews in the U.K. didn't simply give the apes pre-made pokers. Instead, each primate had to snap a board of soft wood into smaller pieces during an 8-minute-long preparation period, before they had access to the grape apparatus. But the apes could see how many tubes were filled with grapes - eight, zero or one - and could anticipate how many poking sticks they would have to craft. Great apes, it turns out, would make a decent Boy or Girl Scout, preparing "tools more often (and in slightly larger quantities) in those conditions requiring them," the scientists write. Not all apes played along perfectly: "For one chimpanzee (Annett) the test was cancelled in her second testing period because she repeatedly destroyed the apparatus, but her available data were included into the analysis." Outliers aside, it is yet another piece of evidence that demonstrates apes can "plan for future needs." Great ape preparation extends beyond mental time travel: They plan for treks through the physical realm, too. Wild chimpanzees, for example, have been spotted embarking on hour-and-a-half long strolls toward fig trees, relying on a mental map to get to their favorite lunch spots. And if they stopped to hunt along the way, chances are they won't go unprepared.